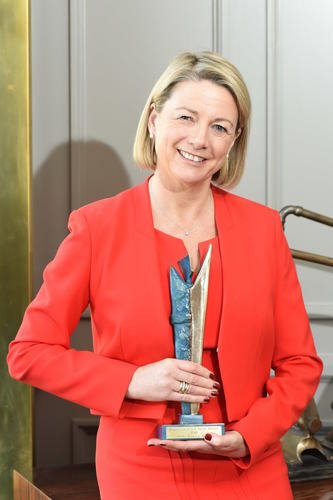 Fiona Dawson, Global President of Mars Foods, Drinks and Multisales, has been named as Ireland’s Ultimate Marketer, at an event celebrating 25 years of the Marketer of the Year™ award, which is organised by Marketing.ie and sponsored since 2006 by Alternatives. Described as a strong, enigmatic and pragmatic leader, Fiona Dawson is also a member of the top-level Mars Incorporated Leadership Team, who oversee $35 billion in global sales for some of the world’s favourite brands. A notable series of career firsts include becoming Mars’ first ever female General Manager. As President, Mars Chocolate UK and Global Retail she demonstrated her commitment to cause related marketing, and created brand partnerships such as Maltesers and Comic Relief, which saw over £2.5million donated to projects in the UK and Africa; Galaxy and Quick Reads, working in partnership to tackle adult literacy projects; and the FA Mars JUST PLAY initiative which helped to get adults back playing football at a grassroots level. She was also the first woman to win the prestigious Grocer Cup which is awarded to business leaders who have inspired their teams to achieve exceptional results. She was also the winner of multiple marketing awards. While her business credentials are impressive so too is her commitment to women’s entrepreneurship and human rights, especially in the developing world where she has spent time in Ghana, Liberia and the Ivory Coast. She has been a strong advocate on the UK’s Women’s Business Council and she has served on the Economic Development Advisory Group to the UK’s Department for International Development. To be considered for Ireland’s Ultimate Marketer, Marketing.ie readers were invited to nominate the person who they believed, through the use of strategy, innovation, and mould-breaking communications, achieved outstanding success. Someone who significantly contributed to the marketing industry and who led, motivated and inspired teams. All the nominees were assessed by an expert judging panel, which included previous Marketer of the Year™ winners while Dr Damien McLoughlin of UCD Smurfit Graduate Business School acted as Chair. Michael Cullen, Editor of Marketing.ie said: “Ireland’s Ultimate Marketer Award was devised to celebrate the 25th year silver jubilee of Marketer of the Year™, the pre-eminent industry award that recognises outstanding marketing talent and Fiona Dawson is an exceptional winner in this anniversary year for the award." Bernie Keogh, Managing Director of Alternatives said “Fiona Dawson is the embodiment of what it means to be a successful 21st century marketer. With a very significant commercial track-record, she’s a trailblazer whose insightful, risk-taking approach has become a template for other marketers to emulate. She is also the personification of one simple truth when it comes to marketing – talent matters.